Occasionally, we are asked about the difference between JumpCloud®’s Directory-as-a-Service® and LastPass. While both are generally in the business of identity management, the two solutions are, in fact, quite different. Before we jump into the differences, let’s take a peek at the similarities between the two solutions. First, both are aimed at helping organizations to increase their security around identity management. Next, both solutions are delivered from the cloud. But, that’s where the similarities end and the differences begin. 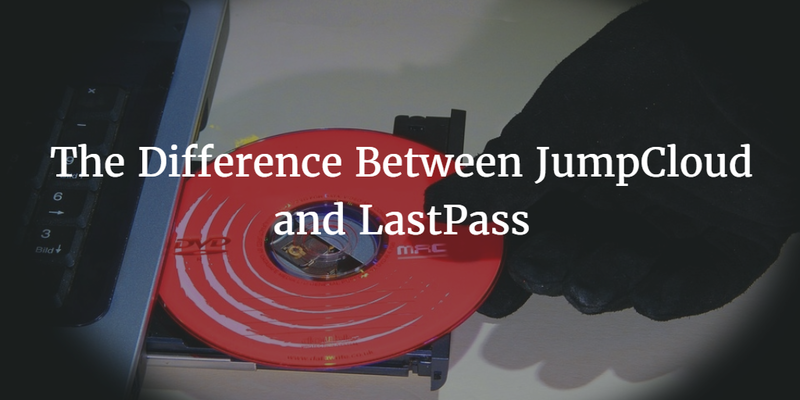 LastPass and JumpCloud are fundamentally different solutions. JumpCloud is the core directory service that provides authentication and authorization services, and it also has the ability to manage devices. Think of JC as the core user database that creates, modifies, and terminates accounts on machines, applications, and networks. Jumpcloud also authenticates those users whether they use passwords or SSH keys. LastPass is a vault for your passwords for all of your devices and Web applications. LastPass’ essential function is in saving the password that JumpCloud forced you to create for your devices and applications. While JC keeps a copy of that password, LastPass helps you by remembering it. With LastPass, passwords that you choose or generate can be much stronger than ones that you would have to remember. In fact, JumpCloud and LastPass work well in tandem because JumpCloud can force you to use a more complex password, and LastPass will remember it for you. There is one other significant point that needs to be made with respect to the difference between JumpCloud and LastPass. The use of JumpCloud encourages separate accounts for each individual on each device, application, or network resource. JC eschews the concept of account or password sharing, although it could technically be possible. LastPass encourages the sharing of accounts and passwords and is a core part of the functionality. In certain instances, the use of a shared account is necessary, although JC actively discourages it because of its inherent insecurity. Ultimately, these are two solutions that can be paired together quite nicely. JumpCloud works in tandem with LastPass (or other SSO solutions like Bitium, Okta, OneLogin, etc.) to provide users with access, but each solution solves a different part of the problem. The benefit of JC is that IT admins have one central place to create accounts and manage them. The advantage of LastPass is that users aren’t required to remember their passwords, resulting in more secure passwords. If you would like to learn more about how you can use both solutions together, or if you would like to further explore the differences, drop us a note, and we’d be happy to review it with you.